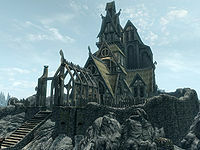 Dragonsreach is the residence of the jarl of Whiterun Hold, the hold's seat of political power, and the location of the hold's jail. It is initially occupied by Balgruuf the Greater and his court, but may be seized by Vignar Gray-Mane if the Stormcloak Rebels prevail in the Civil War. The palace, which is divided into four sections—the Main Hall, the Living Quarters, the Great Porch, and the Dungeon—is located in the Cloud District of Whiterun, overlooking the city. The main entrance is at the top of three flights of stairs starting from the Gildergreen tree, with two pools intersected by the stairs. There are four doors to the outside, though only two are accessible from the ground: one opens to the main hall, while the other leads to the dungeon, which serves as the hold's jail. A third door opens to a balcony high above ground from the living quarters and the other opens to the Great Porch from the main hall. The palace was built around a dragon supposedly captured by Olaf One-Eye and imprisoned in the present-day Great Porch. Around the first pool are a few specimens of hanging moss. In the second pool, there is a skeleton, eight Nordic barnacle clusters and some salmon. To the left side of the second pool are two lavender plants, and to the right are another three lavender plants and the door to the dungeon. * If the Stormcloaks capture Whiterun, these people will be exiled to the Blue Palace in Solitude. ** Until the Stormcloaks capture Whiterun, these people reside in Jorrvaskr. ‡ Vignar Gray-Mane will become his own steward if something happens to Brill. † Depending on who wins the battle for Whiterun, the guards are replaced by either Imperial soldiers or Stormcloak soldiers. The hall is focused towards the Jarl's throne, which is visible through the shimmer from the fire, adding a certain mystical quality to his appearance. The entrance room is a waiting area, with four benches for sitting in. The servants Fianna and Gerda spend most of their time here, keeping it clean. The stairs lead up to the dining area and throne. Centered around a large fire, there are two dining tables with five chairs at each, while up the steps is the throne area and Jarl Balgruuf's throne, which is on an additionally raised platform. Balgruuf is flanked by two guards, his steward Proventus Avenicci, and his housecarl Irileth. His brother Hrongar acts as an additional guard, but wanders the room, and his court wizard, Farengar Secret-Fire, only rarely ventures out of his shop, except when the main quest Odahviing has been progressed to when Odahviing has been captured. To the left of the throne is a table, and to the right is another table and two bookshelves. The Jarl's three children—Frothar, Nelkir and Dagny—have free rein of the palace, and can be found anywhere from the kitchen to the balconies above the hall; sometimes they can even be found outside the palace. To the west of the fire is the kitchen, just before which, to the right-hand side and down some steps, is a door to the dungeons, and to the left is a table with some green apples, and two bookshelves. The food table closest to the fire contains raw meat, and on and underneath the other food table are some food items and some garlic, with a cupboard at one end. There are two wardrobes and a cupboard by the southern wall, and a rack with two harvestable salmon and one dried elves ear hanging beside the cupboard. The north wall is mainly a large fireplace with a cooking spit in front of it, with an end table and a cupboard in the eastern corner with some more food items on it. Hanging down from the kitchen's ceiling are two rabbits, two salmon, three garlic braids, three dried frost mirriam, and eight dried elves ear, all of which can be harvested. The northwestern corner leads down some stairs to a storage area and a servants' bedroom. The storage area contains a few sacks and barrels, while the bedroom contains an owned bed, a dresser, an end table, and a chest. A copy of the rare book A Dream of Sovngarde can be found on top of a bookshelf. A door on the western wall leads to the servants' section of the Living Quarters, and to the right of that is another door which leads to a room with more sacks and barrels, and a locked door†. 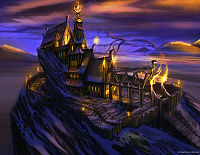 To the east of the fire is the court wizard's research and living area of the palace. To the right of the door is an additional dining table with two benches and a wardrobe. There is an alchemy lab, an arcane enchanter, a chest, a cupboard, and a large map of Skyrim. On the desk display are a few potions, a common soul gem, and a bone meal, and on the cupboard is a petty soul gem. The study to the left contains a cupboard, a coin purse on the table, and a copy of Lost Legends and The Legend of Red Eagle on the bookshelves, which both lead to quests. The bedroom to the right contains an owned bed, an end table, and a dresser. At the top of the stairs to the side of the Jarl is his war room. Contained here are a chest, an end table, and two wardrobes. The balconies to either side are accessible from here, although there is nothing to be found on them. On the end table is a display case with an Apprentice-level lock containing a leveled dagger, and on the bookshelves beside that is a copy of the hard-to-find The Wolf Queen, v6, and a copy of An Explorer's Guide to Skyrim, which adds some map markers. There are two maps on the table and two on the wall behind it. The left-hand map on the table and the right-hand map on the wall show the different Hold borders and their capitals. The left-hand map on the wall is a detailed map of Skyrim, and the left-hand map in the table is also a detailed map, with the addition of little colored flags, which can be activated to add locations to your map. The red flags mark Imperial-held cities, towns, and forts, while the blue flags mark Stormcloak-held locations. This map and others similar to it will update to show the changes made during any Civil War quests. 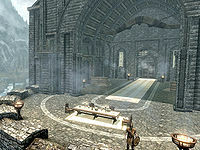 Doors to the Jarl's Quarters and the Great Porch are located to the east and north respectively. †The locked room contains the book Admonition Against Ebony and the Ebony Blade. It can only be unlocked during the quest The Whispering Door with a key obtained from either Balgruuf or Farengar. There are six bedrooms here, for all the palace's residents, and a door to an outdoor balcony that overlooks all of Whiterun. In the hall at the bottom of the stairs are four display cases; three with Apprentice-level locks and one with a Master-level lock. The Master-locked case has an elven sword, the case to the east has a Whiterun Guard's armor and shield, the case to the north has a steel dagger and a banded iron shield, and the case to the west has a few household items. There are three flower beds which contain three lavender plants each, one at the bottom of the stairs and two at the top. 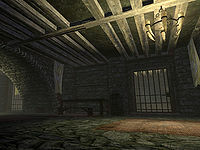 Proventus' bedroom to northeast of the hall contains his bed, three wardrobes, a chest, and a display case with an Adept-level lock containing a necklace. On both sides of the chest is a potion. The stairs lead to the servants' quarters, which are divided into five rooms: a dining room with a larder, a sitting room, and two small bedrooms. There are a few wardrobes, chests, barrels, and sacks spread throughout these rooms, and the door to the Main Hall storage room is here. 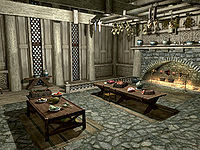 Hrongar's bedroom is to the left at the top of the stairs and contains his bed, two end tables, a dresser, a cupboard, two silver ingots, and a coin purse. 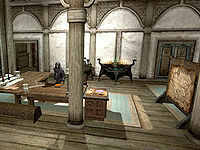 The children's bedroom is opposite Hrongar's room and contains the three children's beds, an end table, a dresser, a wardrobe, a chest at the bottom of each bed and on the end table is a silver sapphire necklace. The Jarl's bedroom has three rooms: a dining room, a study, and his bedroom. In the study is the Illusion skill book Before the Ages of Man, two coin purses, a leveled Paralysis potion, and seven silver ingots. The Jarl's bed is surrounded by two end tables and three wardrobes. On the end table to the right is an Unusual Gem. The door leads to an outside balcony from which you can see all of Whiterun; it is also possible to make out Honningbrew Meadery to the south and Bleak Falls Barrow in the mountains to the southeast. The porch is used as a practice room for the guards and an additional dining area for the Jarl. Just before the dining table are two flower beds with two lavender plants each. There are large piles of hay with a training dummy surrounding two large mechanisms, which are revealed to be parts of a dragon trap during The Fallen. On both sides of the door are a set of stairs which lead to a small balcony at either side. On the pillars above the mechanisms are pull chains, which, when pulled, do nothing; they are used in the aforementioned quest. The porch faces slightly northeast, and to the north can be seen Whitewatch Tower and Loreius Farm. The Dungeon contains four cells kept by three guards. The cell that you occupy if you are arrested has an "Escape Route" shadowmark to the right of the Novice-locked gate and a dead bandit. Three of the cells are Adept-locked and contain cots that can be used at any time. The third cell is unlockable and is where an Alik'r warrior is imprisoned during In My Time Of Need. At both ends of the main section are some barrels and sacks. The room to the northwest has an Adept-level lock, serves as a dining room for the guards, and contains some food and barrels. A second room is furnished with four beds for the guards. The room to the southeast is the public side of the jail. There is nearly always a guard on duty at the desk. The prisoners' belongings chest and the evidence chest sit in the eastern corner. After Dampened Spirits, Sabjorn resides in the dungeon but comes and goes freely. He sleeps in one of the cells, but walks around outside the cells without harassment. The escape tunnel is a virtually linear path from the locked grate to the Guard Barracks, and contains a fly amanita plant, a hanging moss plant, and nine torches. The books Lost Legends and The Legend of Red Eagle (both quest starters) can be found in Farengar's study. The book An Explorer's Guide to Skyrim, which adds map markers, can be found by the map table. Dragonsreach is mentioned in the books Olaf and the Dragon and Adonato's Book. Once you have completed Dragon Rising, the Jarl's bed is usable and all low-level items are free to take. If Balgruuf is exiled to the Blue Palace, his family does not move with him, and they have no recollection of the event. There is an "Escape Route" shadowmark to the right of the grate with a Novice-level lock in a cell in the dungeon. The escape tunnel is a linear path from the locked gate to the Guard Barracks. If one is facing the door to Dragonsreach and going over to the left side of the drawbridge, then going over to the top of the stairs and standing on the left of it next to the draw bridge, it is possible to slip under Dragonsreach and walk under the level. Various occupants of Dragonsreach, including the guards, may suddenly start attacking you for no apparent reason. One cause of this is Irileth and/or Hrongar's Aggression value, which may inexplicably be set to 1, causing her/them to attack you, and causing nearby NPCs to attack as well.